Dead birds (called salvages) found by Chicago Bird Collision Monitors are taken to the Chicago Field Museum's Bird Division. Between 2003 and 2010, CBCM volunteers collected almost 19,000 specimens for the Field Museum! These birds became part of the museum's research, education, and display collections. Rather than simply being discarded, salvaged birds contribute significantly to knowledge about their species. 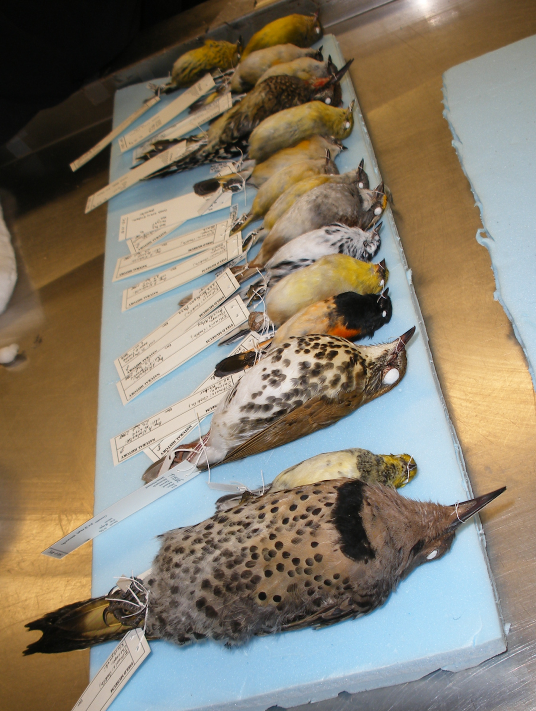 "Although it is tragic that so many birds are killed in window collisions, by salvaging the birds, we have an opportunity to collect data that would not be available otherwise," explains Dave Willard, Collections Manager of Birds at the Field Museum since 1976. The records of salvaged birds serve to document the incidence of window kills. This information can inform policy makers, property management and designers of the hazards that glass, lighting, and landscaping present to migratory birds, and can provide incentives for making properties safer for birds. The study of salvaged birds advances understanding of bird populations, migration patterns, breeding behavior, physiology, bird health, and ultimately the health of the environment. Examining a specimen provides far more information about a bird's natural history than can be gained by field observations. Collecting a large sample of birds from a particular species allows scientists to draw better conclusions about the species current conditions, as well as about changes in the species over time. In addition to specimens being prepared as study skins or skeletons, tissue samples are taken and frozen for future genetic studies. Most research on the specimens collected has yet to be done. According to Dr. Willard, who has been salvaging birds at McCormick Place since 1978, "We are preserving these birds for posterity. We can't presume to have already answered all the questions." For example, DNA analysis now can be done on eagle eggs collected decades ago. Research also can be done on species that are now extinct. All this is possible because someone collected and preserved the specimens. As new questions are asked and new techniques become available, future researchers will appreciate the salvage efforts made by volunteers like CBCM volunteers. Salvaged birds reduce the need for the museum to collect from live populations for their research and display purposes.